This calico kitten is sitting on a clipboard with a pencil and ball. On its head is a ball cap that says CAT (a team?). 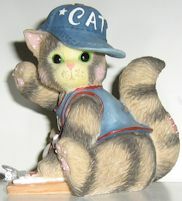 This calico kitten is 2 3/4" high x 2 1/2" wide x 2" deep. Design copyright 2000. Original ownership certificate included. Previously owned but in good condition. No visible defects.